A month ago I purchased this cutie for a ridiculous price (the seller was super sure it was a Squier Jaguar! 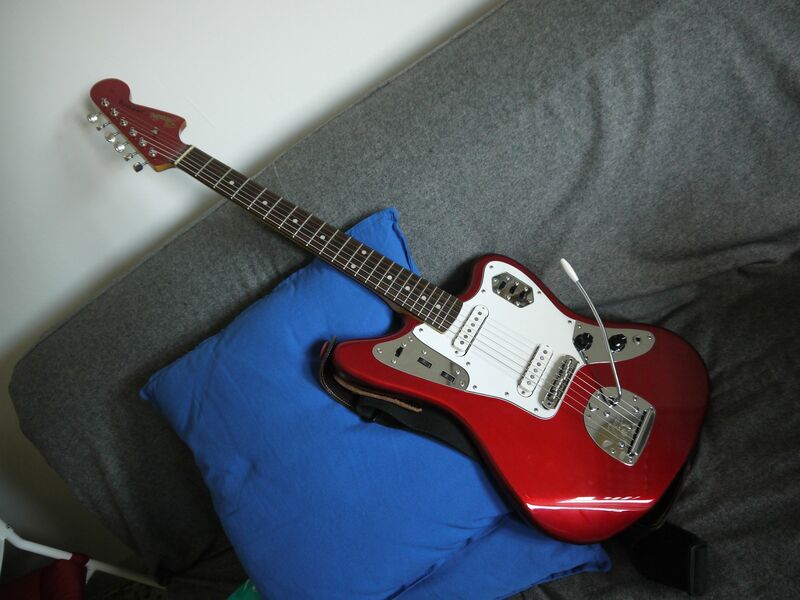 ), it's a 2002-3 CIJ old apple red Jaguar. It plays great (even if the fretboard has a small bump somewhere in the first frets, but it doesn't really affect the playability other than setting the string height a little higher than I'm used to, but actually it's still super comfortable), the vibrato is surprisingly stable, and the pups don't sound that bad. I dropped one of the new Staytrem fixed bridges and quite like it, it probably affects a little the tuning stability using the vibrato but again I'm used to retune it very often, so it's not really an issue. My main gripe is about the sound. The pickups sound better than I expected, but the sound is thinner than what I'd like. It's not a problem of the japanese pickups (I used to have an AVRI some time ago and the sound of this one is not so distant! ), it's more a problem of the vintage jag sound which is too thin for my needs. I play jazz funk, love this guitar (super comfortable to play and it's really gorgeous just to look at) and need a warmer and thicker sound. What kind of pickups would you suggest? I'd avoid boutique ones since they are quite expensive, and I would have no problems putting humbuckers in this guitar. FYI I also have a Gibson Les Paul Special P90 and a Squier VMJM with Creamery WRHB, and would like to have pickups at least as warm as the ones on these other guitars.. My main amp is a Mesa Boogie Mark III set clean with a T-Rex Moller overdrive, a Mooer Blue Faze (sounds like a starved fuzz face on acid) and other stuff..
Seymour Duncan Quarter Pounder for Jaguar. Best Jag pickups ever. AVRI for neck, it is much fatter sounding than the specs indicate. Agreed on quarter pounder for bridge; it's not too hot. And, honestly, the Squier "Duncan Designed" bridge pickup sounds fantastic to my ears. So you would recommend the AVRI over the quarter pounder for the neck pickup, right? Have you ever compared the avri with the duncan sjag vintage one? I think they are a bit harsh on the cleans. SJAG-2 all the way for me, hot vintage sound. They handle almost any style. It's funny because you are one of the very few who praise duncan hots.. have you compared them with other jaguar pickups? The name is a bit misleading, they aren't as hot as a QP and if I remember right the output is lower. I've tried about four different types (including the QP, vintage, CIJ and AVRI) and preferred them. I currently have some in my Duo, although the claw isn't present and I used 500k pots. Kind of related; I found it interesting that J Mascis used Duncan Antiquity pickups in his Jazzmasters and not higher output types despite his high gain sound. His theory was the magnets had mellowed with age and didn't sound as harsh with high gain. Another option could be changing the 1meg pots to a lower value, but that's another debate. Considering most Fenders used 250k, there must be something in it. It's been some years since I tinkered with Jaguars but there's plenty of others on here like paul that good knowledge on them. Nice Jag btw and for the record, stock CIJ pickups are by far the worst of the bunch in my opinion. Upgrading will turn it into a great guitar. Could you compare the hot and the quarter pounders? Is the neck QP harsher too? From the (few) clean soundclips it sounded warm and round rather than harsh.. How would you compare them against avri's? I don't have experience with the Jaguar side of this, but anytime I buy AVRI single coils ('50s Strat and '60s Tele so far) they're the best vintage-style Fender pickups I've ever tried (even having advantages over actual vintage pickups which are usually all worn out/weaker by now or just had crazy inconsistent tolerances to begin with), and anytime I try Duncans they're something a bit more modern and robust that handle palm-muting and psycho dirt pedals, etc... a little better. YMMV, naturally... will have a lot to do with your amp, what you use for gain, and the natural sound of your guitar whether it has pickups in it or not. I'm talking bridge position only, the hot sounds more musical to me if that makes sense? It's more tonally balanced, yet I found the QP a bit bland, like ceramic pickups. It didn't particularly shine in any department and was all high mids. Cant remember the AVRI, it's so long ago. The good thing with pup upgrades is they hold most of their value in the event of a resale. So it may be an idea to try a few. The SJag-2, I had in a Jaguar years ago. My memory may be a bit clouded, but I remember it as being "just OK", better than the factory MIJ pickup it had, but nothing exceptional about it. Still too weak for my taste. Duncan's own demos are a pretty good comparison. I'm also having a weird idea.. has anyone ever put a pair of SD lil 59's in a jaguar? From the clips online they sound really full and warm but articulate - and I play lots of complex jazz chords.. I think a few have, same with the JB Jr which I have also tried, a lot of folk tried to beef up their Jags sound at one time. I also routed for humbuckers once. Then everyone seemed to switch to other guitars which were more suitable for the sound they were looking for. You can go so far with it. Interesting.. I will probably stick to a vintage sounding neck pickup (probably the AVRI), and put a QP/lil 59 in the bridge. Actually I like the neck sound in this guitar, it's just the bridge which is too thin for my needs. And ergonomically it's so comfortable to play! Ok, pulled the trigger on a Novak set. The previous owner (who never actually mounted those p'ups) asked Curtis for a vintage set with a warmer and bassier sound, while retaining clarity. it seems perfect for me! I'll let you know..
Hi guys! I ended up with that Novak set I wrote in the post before. I had them installed on the guitar and BAM! They sound almost exactly like the old japanese ones. They have a little more definition and the bridge is less anemic, but the mid and neck position are 90% the same as before - so thin and trebly. I'm not saying this by memory, before having the guitar modded I recorder some quick clips and then re-recorded them with the exact same setup - and the sound the same! Should have gone for SJAG-2 like that fellow said. And you can get a thicker tone just by changing the bridge, too. Actually the bridge is great (a new staytrem), and to me changing bridge doesn't make such a great difference in tone.